Aztec serpent, Aztec double headed serpent, Aztec Art, Aztec, precolumbian reproductions, mesoamerican reproductions. 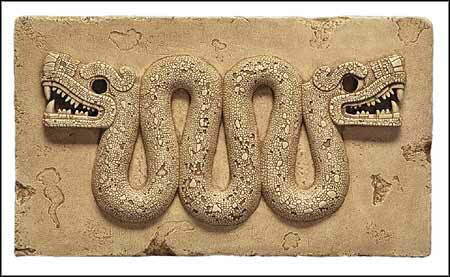 Splendid relic of the Aztecs, who rose from squalid origins to power and riches in just 200 years, this double-headed rattlesnake serpent was used as a ceremonial chest ornament that may have been worn by a priest. It is incrusted with scales of turquoise, a stone the Aztecs imported from the outposts of their empire to adorn some of their most beautiful possessions. This piece is the work of a Mixtec jeweller, and dates from the 15th century. Mixtec craftsmanship was highly prized; an entire enclave of artisans from this culture lived in the Aztec city of Tenochtitlan. In mesoamerican culture, serpents were very important religious symbols, the shedding of their skin made them a symbol of rebirth and renewal. One of the main mesoamerican deities, Quetzalcoatl, was represented as a feathered serpent.